Switchgrass, Panicum virgatum, is a perennial bunch grass that spreads by rhizomes to form colonies. The average height is three to six feet. The stems are tough, hard and hollow. The ligule (the appendage that arises from the surface of a leaf junction with the leaf sheath) is a dense ring of hairs. The leaf blades are flat and up to 30 inches in length and 1/2 an inch in width. The seed head is an open panicle up to 10 inches in length. 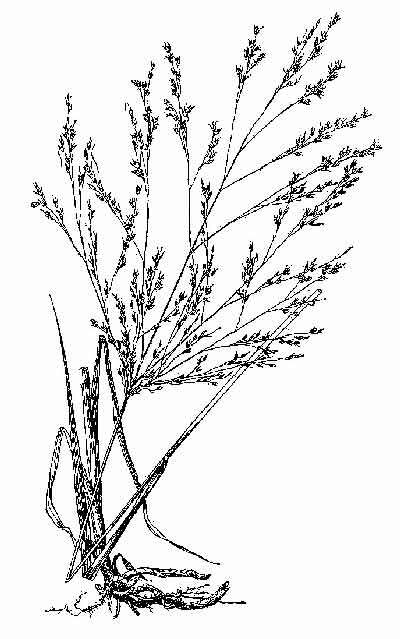 The spikelets (a single flower within a grass's inflorescence) are up to 3/16 of an inch in length, which is considered large for the genus. Switchgrass is one of the tallest panicums of the southeast. It grows throughout the southeast occurring in wet flatwoods, prairies, open woods, and brackish marshes in Florida. In Arkansas it grows in rocky soils, and in Tennessee it grows in grassy plains. Its tolerance of shade make it an important native grass in forested areas. It is adapted to floodplains, however it does occur on sandhills. Major foliage growth occurs during March to September. Rhizome growth is most active in January, February, March, and April. Seed heads are formed in August to October. It is an excellent source of grazing forage for livestock and deer. The large seeds that are produced in quantity provide an excellent food source for birds, especially quail.